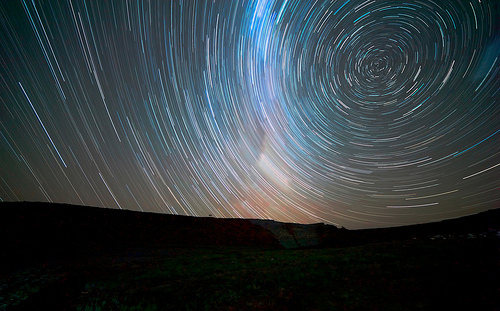 Star Trails are created because of Earth’s rotation during a long exposure photo. 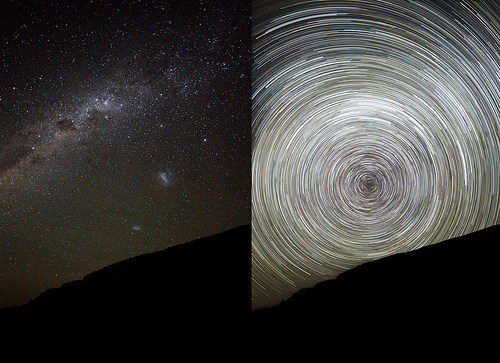 The stars fixed (almost) in the sky show trails along with the rotation of our planet. 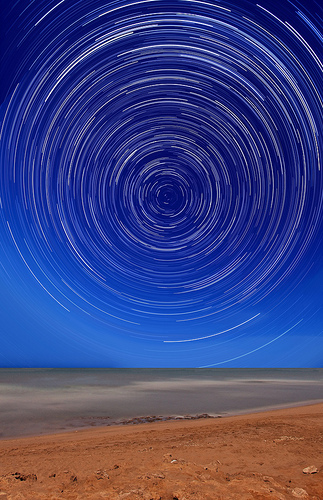 Here are some useful tips to create beautiful star-trails photos. This is simple: The longer the focal length the longer the trails. With a wide angle lens you need really long exposures in the order of minutes for the trails to be noticed, with a telephoto lens the trails appear in a few seconds but composition becomes more difficult. The length of the trails also depends on the area of the sky you are photographing, the closer you are to the celestial pole (see tip 7) the shorter the trails will be. The reason is very simple, all the stars travel in a complete circle around a fixed point of the sky every 24 hours. So as you get closer to the celestial pole the stars travel less distance per unit of time. 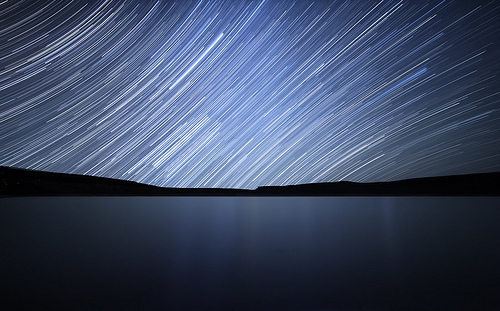 The key for star trails photography is to find a good composition, the trails are nice on their own but you need a landscape or a foreground object to make the photo interesting. A silhouetted object can frequently be interesting just make sure you have the complete scene in focus! You need a solid tripod, if the tripod moves you are doomed. Make sure the tripod is stable and shielded from the wind. A remote intervalometer is also a great tool, you can program it to take the exposures for you while you take a Coffee. Don’t forget to use a fully charged battery. You can find the Celestial Pole using a compass and knowing your latitude, with the compass aim north if you live in the north hemisphere or south if you live in the south hemisphere. Then the pole is at the same height as your latitude. So if you live at 35 degrees north the celestial pole is 35 degrees high in the sky pointing north. If you live in the north hemisphere and you know how to find Polaris that works perfectly too. If you take several photos make sure you have in-camera noise reduction off to avoid gaps in your trails. If you go for the single exposure approach then you can turn it on but the photo will take twice as long as planned. Make sure you have good batteries for it! To minimize gaps in your trails try to use the shortest possible interval between photos if you take several exposures. You win nothing waiting a few seconds and the trails will look like dashed lines. When post-processing star-trails start with noise reduction, then adjust contrast and saturation and finally sharpen to taste. Removing noise is the most important step, then its just about your taste. 5 Comments on "10 Useful Tips for Photographing Beautiful Star Trails"
Thanks for the most straight forward starstar trail lesson I’ve read so far. Thank you, it has been very helpful! Nice blog, I have saw all the photos. All of them are very good. Luis excelentes ideas, gracias por compartirlas. Very lucid and useful site as well as good photos to illustrate each point. Thank you!